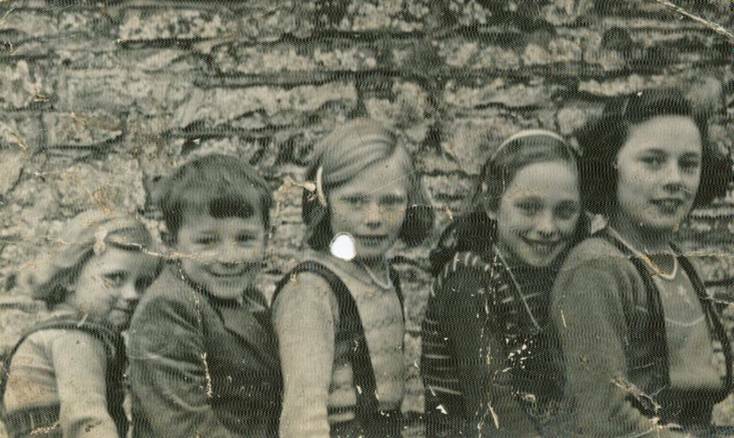 Five Cumwhitton Marriages in the 1930's. (children of John Robley and Margaret Jane McKitterick of Low Northsceugh Farm). John & Margaret with the wedding photographs of their 5 children Contributed by Iris Rogan. Margaret Maud Robley/Richard Mitchell Armstrong. Photograph contributed by Joe Robley of Demesne, Cumwhitton and Kathleen Mary Young (formerly Robley), of Guildford, Surrey. The bridal party after the marriage, at Cumwhitton Church, on 10th November 1937, of Mr. Richard Armstrong, son of Mr. and Mrs. Armstrong, Roadhead, and Miss Margaret Maud Robley, daughter of Mr. and Mrs. Robley, Low Northsceugh. Note. 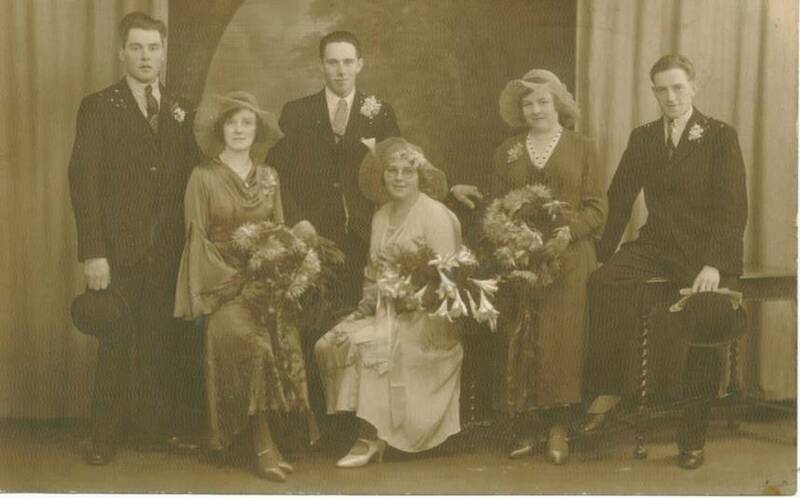 Left is Peter Armstrong (father of the groom), second from the left is Elsie May Blaylock (sister of the bride). 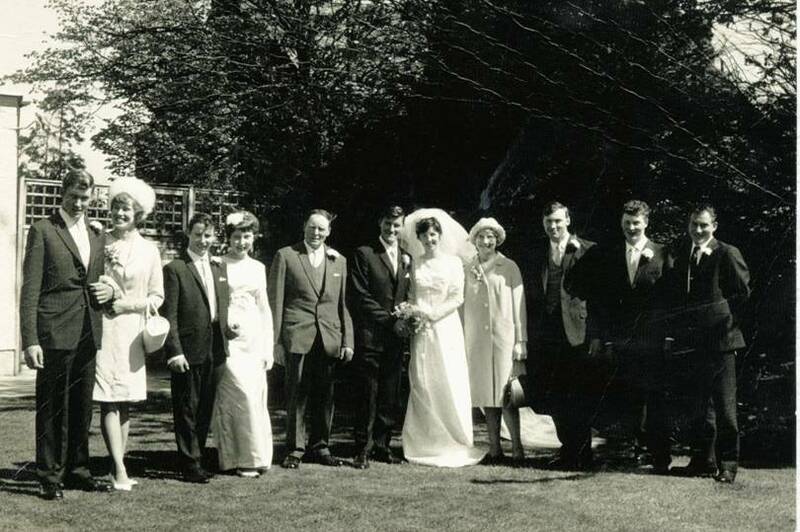 The very tall man, third from the right, is John Robley (father of the bride). The bridesmaid is Margaret Jane Armstrong (sister of the groom). The child is John Blaylock (son of Elsie May and Henry Dalton Blaylock). Richard & Maud had 6 children Brian 01- 05- 40, Florence Irene & Thomas Ivor 03-01-43 (twins), Margaret Iris 28-11-49, Harold 09-12-52, & Colin 01-02-54. 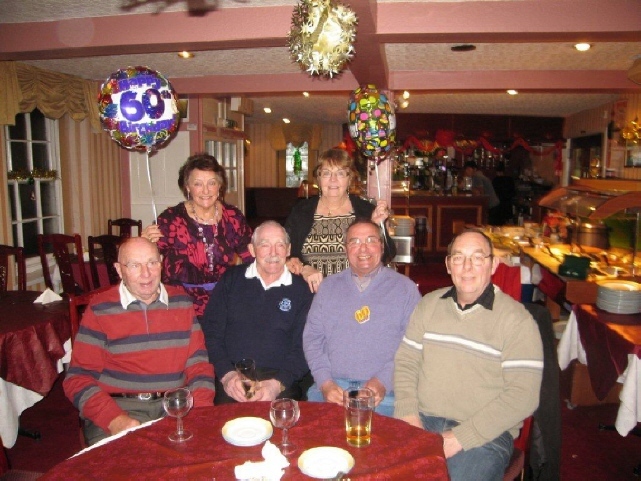 The Armstrong family, taken in December 2012 when Harold was 60. Pictured in order of age. Elsie May Robley/Henry Blaylock. Photograph contributed by Iris Rogan. A group taken after the marriage, at St. Mary's Church, Cumwhitton, of Mr. Henry Dalton Blaylock, Bridge House Farm, Hesket-New-Market, and Miss Elsie May Robley, Low Northsceugh Farm. Left to right: Mr. J. Robley (groomsman), Miss Edith Blaylock (bridesmaid), the bridegroom, the bride, Miss Margaret Maud Robley (bridesmaid), and Mr. Arthur Blaylock (best man). St.Mary's Church, Cumwhitton, was filled on Tuesday morning on the occasion of the marriage of Mr. Henry Dalton Blaylock, younger son of Mr. and Mrs. T.S. Blaylock, Bridge House Farm, Hesket-New-Market, and Miss Elsie May Robley, elder daughter of Mr. and Mrs. J. Robley, Low Northsceugh, Farm. The bride, who was given away by her father, was attired in an ankle-length gown of shell-pink crepe-de-chine and picture hat with orange blossom and pink satin ribbon, and wore silver shoes. Her bouquet was of arum lilies and maidenhair fern. Two bridesmaids accompanied the bride - Miss Margaret Maud Robley, sister of the bride, and Miss Edith J. Blaylock, sister of the bridegroom. They wore ankle length gowns of blue satin and picture hats trimmed with blue velvet and blue satin shoes to tone; each wore a gold and pearl necklace, the gifts of the bridegroom, and carried bouquets of bronze chrysanthemums and maiden hair fern. Mr. Arthur Blaylock, brother of the bridegroom, was best man, and Mr. John Robley, brother of the bride, acted as groomsman. The reception was held at the bride's home, where the usual toasts were honoured. Mr. and Mrs. Blaylock were the recipients of many handsome and useful presents; the bridegroom's gift to the bride was a gold and diamond dress ring. Later in the day Mr. Blaylock's bride travelled in a blue ensemble. From The Cumberland News. This cutting comes from the collection of Maud Sarah (Robley) Ferguson of Cumwhitton, and Frith Farm, Guston, Dover. It was contributed by her grandson, George Rogers of Reading. 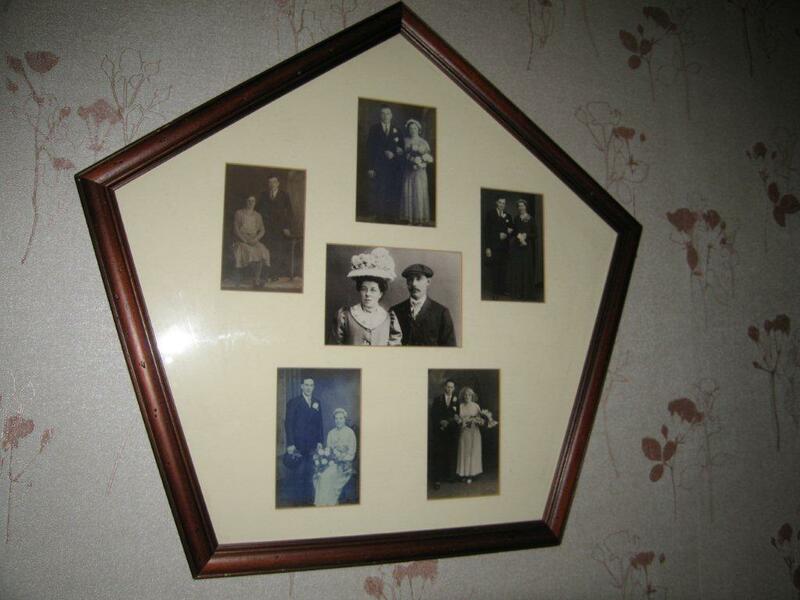 Elsie & Harry Blaylock had 7 Children. In descending order: Eileen, Margaret, Audrey, Henry & Joyce. John, the eldest & Raymond, the youngest are missing from this photograph. Photograph contributed by Iris Rogan. Christopher Robley/Elsie Shaw. Photograph contributed by Iris Rogan. 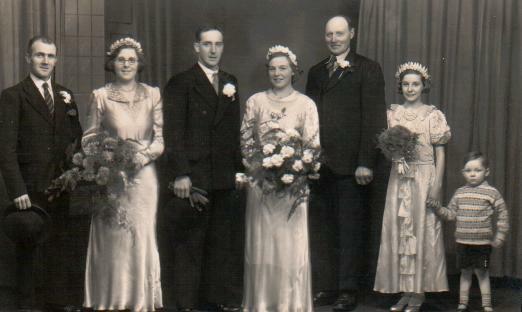 Marriage of Christopher Robley and Elsie Shaw took place on 30th November 1935. 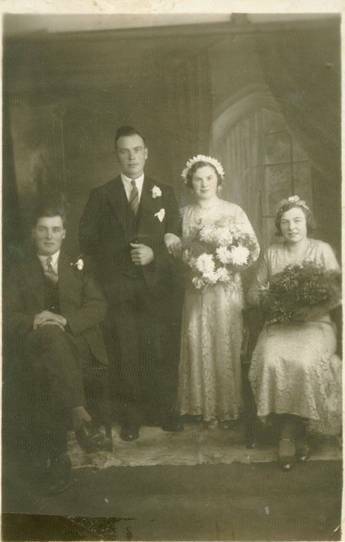 Christopher's brother, John (Jack) and his sister, Margaret Maud were best-man and bridesmaid. Joseph Robley/Anne Ferguson. 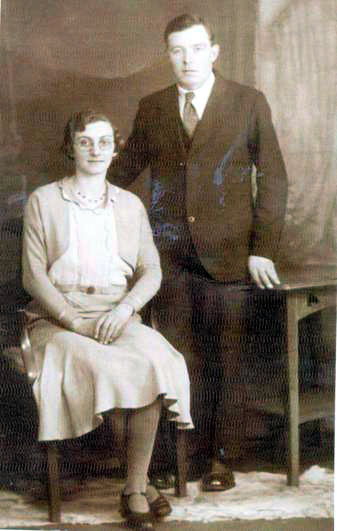 Joseph Robley married Anne Ferguson in 1932. Photograph contributed by Iris Rogan. Jack Robley married Mary Wilkinson of Carlatton Mill on 13 November 1937. Photograph contributed by Iris Rogan. Jack & Mary had 7 children. Margaret died as a baby in a cot death. Here are the remaining 6 children, some with their partners. Left to right: William Louis (Bill) with Doreen, Kathleen with Gerald Young, Jack (father), Maurice Matthew (Matt) & Heather, Mary (mother), Joseph Wilkinson (Joe), Arnold & John. Photograph contributed by Iris Rogan.